He entered the room alone, motioning the door closed behind him with a lazy wave of his hand. A practiced eye swept the room briefly; unnecessary in this sanctum, but following old and well-trodden pathways in his mind. He strolled down the length of the long polysteel table, absent-mindedly touching the headrest of each seat as he passed, and dropped lightly into the worn leather swivelchair at the end. Leaning back and propping his feet on the table, he darkened both windows a little and started browsing reports on his neocom. Time passed quietly for a while, save for the gentle whirring of unobtrusive hardware, the filtered sunlight's gentle orange sheen punctuated at reassuringly familiar intervals by black shadows sweeping across the room. A subdued flash outside stirred him, and he raised his head to gaze out through the window. A small ship, glowing orange; then a bigger flash, and another ship appeared. Larger, sleeker and a deal more menacing, the Widow gave him only a few moments to admire its elegant lines as it slid rapidly into the nearest docking bay. Moments later, the door opened. "Sir, your first guest has just arrived." "Yes, I was just watching him jump in. Remind me to get myself one of those." "Yes. Good-looking ship, and our pilots speak highly of them." "Yes, sir. Would you like me to reserve a slot for it in your hangar? We could fit it in between that Scorpion you took out for a spin three years ago, and the Rattlesnake you won off The Rabbit and never finished fitting." "Well, you can easily afford it, sir, and it's a great-looking ship." "True. Okay, remind me to think about getting myself one of those some day." "Yes, sir. The room's completely clean, and the overt recording devices, the covert recording devices, the backup recording devices and the recording devices that you had me fit as an insurance policy have all been completely removed. The only thing in this room with a pickup is your neocom, and we're actively sweeping all penetration points." "We also had another look at general security, and we've installed a ballistic filter and a particle screen on the inner window. I know your opinion on that sort of thing, sir, but with the particular guests you have today... "
"Yes. Yes, you're right. I don't like it, but you're also right that we shouldn't be taking the risk here. Good thinking." "Thank you, sir. He'll be along in a few moments." He left the guard at the door and entered alone. The room was in darkness, but what little he could see was comfortingly familiar - sparsely and cleanly furnished, with a long boardroom table lined with empty executive-grade chairs. Without warning, the sun rose magnificently to his left, and his weary eyes drank in the orange warmth. He moved to the window, gazing out at the station's unsettlingly smooth lines, and the gigantic rotating rings of its laboratories, factories and testing facilities. Movement brought his attention down, as below his feet a cluster of ships soared out of the launch bay and aligned for warp. Other ships were coming and going, singly or in small groups - mostly capsuleers, his intel had told him, operating out of this lonely outpost and clearing the spacelanes of marauding Guristas. Then he was aware of someone at his side, and he turned. "Our capsuleer associates have proven remarkably useful over the years." "Yes. I've heard that you do good business with them out here." "We do indeed. They're good customers when you handle them right." "And monsters if they get out of control. It's good to finally meet you." "The feeling is mutual. I've been following your recent activities with some interest." "It feels like everyone has, and not all the interest is the good sort." "Indeed. I hope your trip wasn't too bad? I was just admiring your ship with my aide. They're fine vessels." "I always found gate travel uncomfortable, and jump drives are considerably worse. But yes, it's a well-endowed ship, and we didn't have any trouble on the way." "That's something to be thankful for, at least. How is business?" "It's been worse. This latest trick of Heth's has thrown a whole bag of spanners into things though. He's doing a very good job of keeping us at each others' throats and away from his own neckline, but it's not good for the State. Or for our agenda, for that matter. If we were in a stronger position, we might…" He trailed off. "But we're not, and so here we are." "Yes. And here he is too, I think." "I don't recognize the configuration of that ship." "Neither do I, but I'd hazard a guess that it's a Proteus." "Oh. Yes. That would explain it. Tech Three. Expensive choice." "Sound, though, if he has the covert configuration. And yes, very expensive. We've been trying to get hold of one, but—"
"We've managed to acquire a few subsystems, but without a power core there's not much to learn." "Yes, and unless you can source the parts yourself—"
"Yes, and with the capsuleer monopoly, market prices are–"
"I wonder where he got that one." "Official budget, probably. He should be up in a minute." He gestured at his chaperone to wait and strolled through the door. A brief glance was all he needed: another meeting room, another day... Without warning, the warmly shining sun was extinguished, and in the darkness his gaze was drawn to the constellation of lights visible through the interior window. Looking down into the station's central concourse, he could see thousands of tiny people moving purposefully along the night-cycle streets and walkways. He wondered what kind of people they were, what their hopes and dreams and fears and hidden levers were, and why they would choose this life, out here in the darkness. Then the room flooded with light again, and his co-conspirators came over to join him. "Welcome to my little world." "And a lovely little place it is, too. Thank you so much for agreeing to host this meeting – and thank you, too, for coming all this way to talk with us here." "Please, no names. This is a huge risk for me, even with the best security measures in place. Not that I don't have the fullest trust in our gracious host, of course!" "It's good of you to say so. I think we'll all need to trust one another today. As agreed, the only recording device in this room is my neocom, and it's neutralizing voiceprints. You have my word on that." "Well, I'm sure that's more than good enough for both of us, am I right?" "Yes, that will be fine. Our host and I were just discussing the ship you arrived on." "That thing? I asked for the most secure ship we had available, but not one with a jump drive. Can't abide those things. Not a very luxurious ride, but the captain assured me it was up to the job." "I'm sure we can find you a replacement for the return journey somewhere in our hangars here." "Thank you so much for the offer, but I'm afraid I got the distinct impression from my staff that if I didn't bring the ship back in one piece, there'd be problems." "Well, that's... entirely understandable, under the circumstances." "Yes, of course. Let me just configure the table." At the deft push of a few buttons, chairs slid back into the floor and the table contracted and reshaped into a compact circle. A holo-display flickered to life, reflecting off the table below and adding to the room's dim ambient lighting. The three men seated themselves and began to negotiate. "If we're all ready, let's start. Would you like to kick off by explaining the deal as it's been presented to you, so we're all on the same page?" 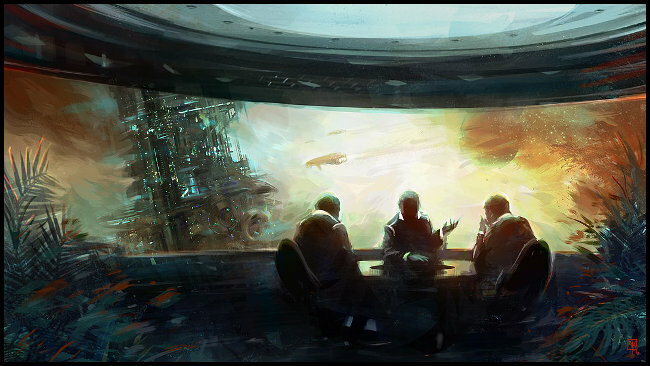 "Heth has decided to auction exclusive economic rights for the contested Gallente areas to Caldari corporations. We will enter bids for any and all systems in the area that we are interested in, and in each system the corporation with the highest bid is granted a transferrable and sub-divisible license to regulate economic activity." "If you would excuse me for jumping in, what is the duration of these licenses?" "Ten years, with first refusal on subsequent renewals." "And if the systems are not still in Caldari hands in ten years' time? You must know that we hardly intend to sit on our hands for the next decade." "The licenses are only enforceable under Caldari law, which we don't expect the Federation to recognize. If the FDU manages to push the State out – in ten years or ten days – then the licenses will reactivate if and when the systems are reconquered." "If you'll forgive me for saying so, that doesn't sound like a particularly safe deal." "Do you really think that your Militia is in any position to mount a counteroffensive?" "I think it might be worth remembering that capsuleers have a reputation for being... inscrutably unpredictable." "A fair point. In any case, it's not a deal we can easily refuse. There's a huge quantity of untapped resources in those systems – the Federation's methods have always been inefficient, and we have the added advantage of not having to worry much about the local population. Yes, I know, but that's how it's going to play out – you think the others are really going to worry about your people? I doubt any of us will be starting planetside operations for a while, but nobody's going to be keeping count of Gallentean mortality rates." "I was aware of this, academically at least, but—"
"Hey, you want to talk to the others and complain, go right ahead. My being here should say enough about my position." "Yes, I'm sorry. Please go on." "Heth's set this up as a blind auction on the grounds that it will lead to objective valuations of the systems, but everyone knows it'll just drive bids through the roof. It's going to be ruinously expensive for everyone, but in the best-case scenario – which looks realistic, if you're still high on military victory – anyone not on the sled will be left in the snow. I've heard mutterings that in the worst case, we're all equally screwed, so the risk balances out. Besides, we still have all those Amarrian loans hanging over our heads, and while they seem happy to let them lie, most of us are keen to lose that particular collar as soon as possible." "Hmmm... I'd forgotten about that financing deal." "It keeps us awake at night. She's planning something, I'm sure of it. That's the situation laid out, though. The State retains military access to the systems, of course, but otherwise they become corporate fiefs." "Which, as you say, will be unpleasant for the Gallenteans living there, but that's a problem that we don't have the resources to tackle." "There is, however, a smaller and potentially more pressing issue which I think between us we might be able to at least mitigate. It's the reason I've expended a great deal of effort – and taken a rather large risk – to convene this meeting. Not all—"
"It's Intaki, isn't it. That's the only thing that makes sense." "Yes, it's Intaki. If you could pull up the map on— yes, there we are. Here's the Placid contested zone – currently under Caldari occupation and, as you say, up for grabs – and here's Intaki, two jumps from Stacmon in the wrong direction. It goes without saying that it would be better for us if this situation had never occurred in the first place, but reality is what it is, and the home of a major Federal member is about to become the property of a Caldari megacorp. We're not exactly on good terms with any of you right now, but even so, some outcomes are preferable to others." "You'd prefer that your new landlord is someone who's not going to throw you down the stairs for fun." "That captures the sentiment fairly well, yes." "So what do we get out of it?" "You're offering us – me – a deal. You want me to buy Intaki to stop it getting completely trashed. I have sympathy for the idea, but we've spent a lot of money on ideas we had sympathy for and it's not worked out well for us financially. Why should I even discuss this?" "Since we're talking about finances, how much of our space are you planning on buying? How much have you budgeted for?" "I'm not at liberty to discuss that, even here." "We have people looking at your people's accounts, and they say yours remind them of the Federal welfare programme back in the bad old days. You can't afford anything." "We're still looking at our options. I have good people working on this, working to find— working to balance the money." "You're out of time for that. The other megacorps have their cash lined up and ready. You're not ready, because you can't afford it." "So what if you're right? What if we can't afford to get a piece of the pie? Why have you dragged me all the way out here to talk about this when you know full well we don't have the means to pay for it?" Two of the men were now hunched over the table, muscles tense, hololight lending their staring eyes unnatural hues. The third reclined in his chair, hands steepled and muscles relaxed, but hooded eyes flickering. For a moment there was silence punctuated only by the whirring machines. Another shadow passed across the outer window, and in the deeper darkness eyes glowed like smouldering coals. Beyond the inner window, crowds continued to silently surge. "Well, we have a common objective here, that much seems obvious, and between us we have all the resources needed to achieve that objective. It's just a matter of aligning things such that—"
"You want to pay us to buy Intaki." "To a political layman, that's probably how it looks, yes." "Where I come from it's called pragmatism!" "Gentlemen, I think we're all outside our comfort zones here. Let's try and keep our eyes on the target." "Yes. You're right. But that is the pitch, if I'm not hugely misunderstanding. The Federation gives us a pile of money, which we can then use to make sure we get Intaki." "It's of no consequence exactly where the money comes from; I can ensure that the necessary sum is made available to your people, which is all that should matter. And on the understanding, of course, that it's used exclusively for this purpose." "Which brings up that question again. Transferring the money secretly is not a problem – deep space mineral exchanges and the like – and my people can easily explain the money appearing on our balance sheets, but again I have to ask: what's in it for us?" "Is a large pile of free money suddenly not good enough?" "You're not thinking this through. Explaining the money's appearance is easy, but I also have to explain why we're allocating all this suddenly available wealth towards bidding for the most problematic system in the auction, rather than picking somewhere more accessible, or even shoring up our existing finances. I need a cast-iron business pitch, and I can't make one with what you've given me. It'd be professional suicide." "I had thought that, with the will and the resources, other problems would remove themselves. It's just a matter of marketing. You have good speechwriters, I assume? I can give you access to—"
"Yes, I can see you have thought about this a great deal, and I'm not questioning your intent or your commitment to this goal. But you're thinking like a Gallentean. My problem is not an electorate, it's shareholders, and we communicate with them using numbers, not words. The only way to sell this is to make it add up." "This is not a problem I had considered. I'm very sorry; I don't have an answer to this." "Then I'm very sorry too, because we have reached an impasse. I can't make this deal work." "I believe I... might be able to see a way out of this. Intaki is resource-poor, it's true, but it is nevertheless one of the wealthiest systems in the Federation." "That's all planetside though, services and advanced manufacturing. We can't leverage that." "What if you could, though? If you come to save them rather than to subjugate them, I think they might cooperate with your goals." "What manner of deal, precisely, are you suggesting here?" "I'm proposing that his people enter into a partnership with your people. You give them exclusive shipping access to the Intaki system, and they agree to shield you from the excesses of the other corporations." "Can they do that? Wouldn't the Federal Navy stop them?" "Federal members retain control of their home systems. Usually security and shipping are franchised out to the Navy and to Fedmart, but it's still under their control. If they wanted to delegate those responsibilites to you, they're legally entitled to do so." "Do you really think the Intaki government would go for that? Permitting a Caldari corporation to manage their interstellar traffic?" "I think that maybe you don't know your people as well as you think. I've been talking to them, through old acquaintances, and they've mentioned the S&S franchise to me more than once. I think they'd be interested in discussing it, and under the circumstances I don't think the shipping rights will be a sticking point. It's security that will bother them, I think." "Yes. I can see how having our ships police their space might look bad." "Our latest assessment of your corporate security forces suggests that they have neither the resources nor the training to do the job. You would need someone who both sides trust, and who has enough spare hardware and manpower to defend the system against any and all threats." "Hah! You are a Caldari after all. I was wondering what your angle was! How much then would it cost us to buy your services for this?" "Ah, let's not get caught up in the details. It's safe to say that our mutual friend here can cover the sort of money we'd be obligated to charge, as part of his donation." "So he gets shipping rights – say, for ten years, renewable – to pacify his shareholders, you get paid to police things, and we have the safety of one of our most important systems secured. I have to admit, it's an elegant solution, assuming your assessment of the Intaki position is correct. And a profitable one for you, too, I don't doubt." "I have a foot in both camps, as it were. I have an interest in these matters." "Of course. Well, as I said earlier, this is an unfortunate position for us, but we have to do what we can. I don't see a better solution arising than this one, unpleasant as it may be." "I think I can sell this deal to my people, assuming you both come through with your end. It is good to be able to make business and ethics coincide. The Old Man would be happy with this." "I have hope that both our peoples will see the sense of it, although I fear that some of them will take longer than others to understand..."
He stretched in his chair, then leaned back and relaxed. Negotiations concluded, hands shaken and ships departed. A holo-map rotated still, a single red dot glowing at its centre. He clicked it off, and as darkness and light chased each other across the room, a smile played on his lips. A good day at the office. Interesting times ahead, and a good day. He left the room quietly, blacking the windows behind him, and the machines hummed to themselves in the darkness.